Ages ago, I did a comparison of all of the basic chocolate bars in Japan. The three basic bars from the big confectioner's are Lotte's Ghana, Meiji, and Morinaga. I rated Ghana the highest, though for basic chocolate, I think "Vessel in the Fog" and Dars are the best. Vessel in the Fog, incidentally, has reappeared in shops with the end of summer. It is often hard to get, but worth picking up if you see it. Given my favoring of Ghana's basic chocolate bar, this looked intriguing. The types of snacks (especially gum) that are sold in this type of packaging are generally more expensive than those sold in paper and foil wrappers or cardboard boxes. I'm not sure if that's because they are supposed to be better value, or if you're paying for the plastic. Either way, they generally do not represent better value than buying such things in other packaging even when you consider the increased volume. For this reason, I tend to avoid these, but I found these on sale at Okashi no Machioka snack shop for a mere 129 yen ($1.67) and decided to give it a go. Black Ghana is a small (82 gram/2.9 oz.) 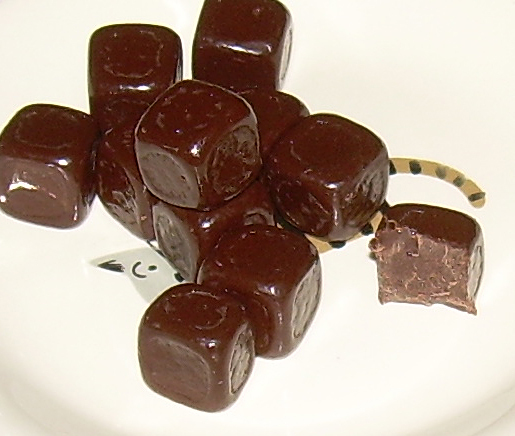 canister of 38 cube-shaped pellets. The whole lot is 482 calories so one piece is 13 calories. This is reasonable for the portion size. The advertising boasts "extra cacao", so this is supposed to be richer than regular Ghana. That's the selling point that lured me in. What it is is a semi-dark chocolate with a high fat content. It's a little more intense than a milk chocolate, but not as bitter as a true dark chocolate. I'm not a dark chocolate fan, but this blend was pretty much right where I would enjoy darker chocolate. It comes up just short of being too bitter and could be seen as a version which is approachable for milk chocolate fans. 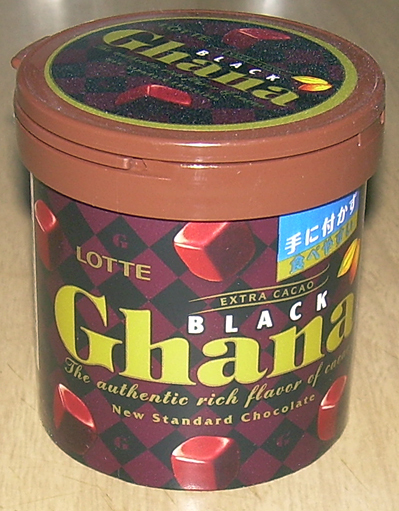 It's still stronger and more intense than regular Ghana, and it still has a familiar Japanese chocolate aftertaste (kind of like how your mouth feels after drinking coffee), but I liked these and I'd buy them again.